The congress Palace - One of Montecatini's symbols, a splendid building that offers the most advanced services, in correspondence with Montecatini's status as a city. The Congress Palace gives a fit answer to the various comunication needs and is a help for the image building of your companyor organisation at conventions, seminars, scientific conventions and other meetings. 3500 square meters, divided into 4 floors, in the city's centre at walking distance from the thermal resorts and the most important hotels (more than 5000 rooms in the 5-4-3 star hotels and over 1000 rooms int he 5 and 4 -star hotels). 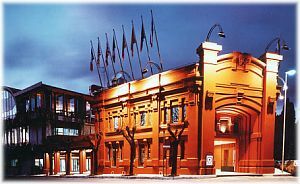 The new congress palace transformed Montecatini into one of the most important italian congress cities, both because of the quality of the hotels as because of the congress rooms itself. The entire congress-structure has been designed with care for the smallest details, creating a image of a refined elegancy. Ground Floor - A modular room of 1000 square meters, suitable for business-breakfasts, cocktail- or other receptions, gala dinners, expositions with stands, fashion-shows, art-expositions or other kinds of meetings. Both on the ground floor and on the second floor is a bar, and each floor has a reception. The highly qualified staff guarantees the best solution for technical or organisational matters and for the various operative demands on all kinds of meetings. In the basement you can find a center, specialised in cosmetics and relaxation techniques, with fitness-center and swimming-pool, all in an atmosphere of complete serenity. 1º Floor - a modular space of 1000 square meters, can be subdivided into parallel rooms, up to 800 seats: this solution offers the possibility to use two rooms with all conveniences: Room Plutone with 700 seats. - Room Le Orse with 130 seats. 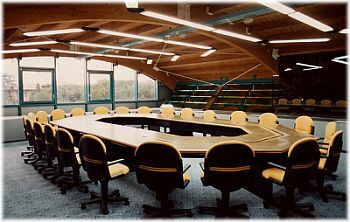 The available space can be made smaller, thanks to soundproof removable walls, up to a maximum capacity of 30 to 350 seats. Technical apparatus i order to achieve a large operational efficiency. All rooms have a small 'stage' for the president's table and the speaker's chair. Linked to the first floor are: a press agency, techical-scientific secretary's room, possibility to make slides and posters. 2º Floor - Room Elio with 850 seats, with fixed technical appartus, incorporated seats and tables, simultaneous translation points in central position, removable electric pannel, mobile stage for speakers, possibility to do video-, film- and slide- projections. The whole of the apparatus is integrated in one direction room. Linked to Room Elio is Room Zenith, suited for press conferences. Possibility to do teleconferencing.